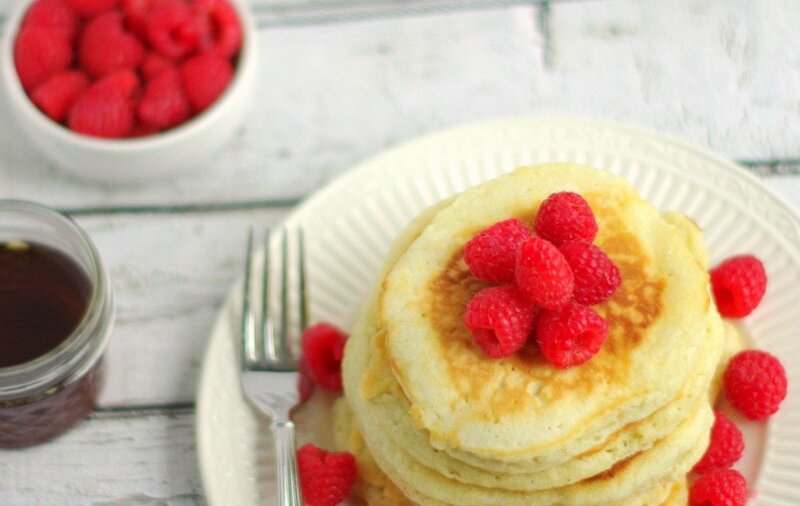 Start your morning with a stack of light and fluffy buttermilk pancakes. 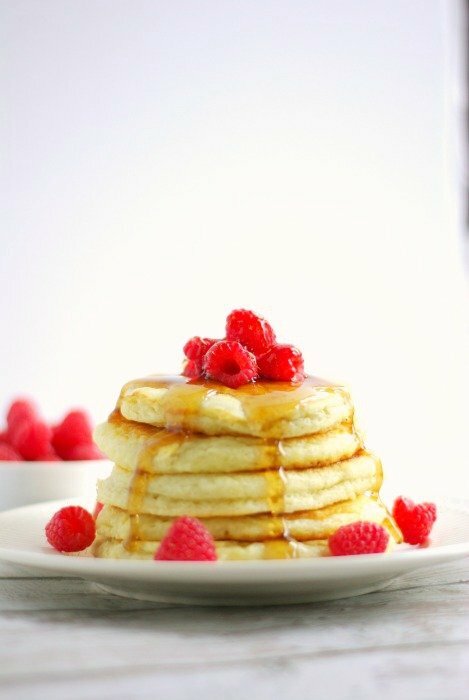 Top your stack with fresh berries and true maple syrup! It never fails. When taking orders for breakfast on weekend mornings I always get, “I want pancakes” from one kid and “I want waffles” from the other. Lucky for me this recipe makes great homemade pancakes and waffles. My kids have gone through phases. They’ve done the frozen waffle thing and pancake mix out of the box and one likes real maple syrup and the other does not. There is one thing they both agree on – there’s nothing like homemade buttermilk batter to start breakfast off right. I like to make this buttermilk batter so there is enough if the kids want pancakes or waffles the next day. I don’t like to save batter any longer than that. And of course my kids prefer freshly griddled over refrigerated or frozen. The waffles and pancakes turn out crispy on the outside and tender on the inside. 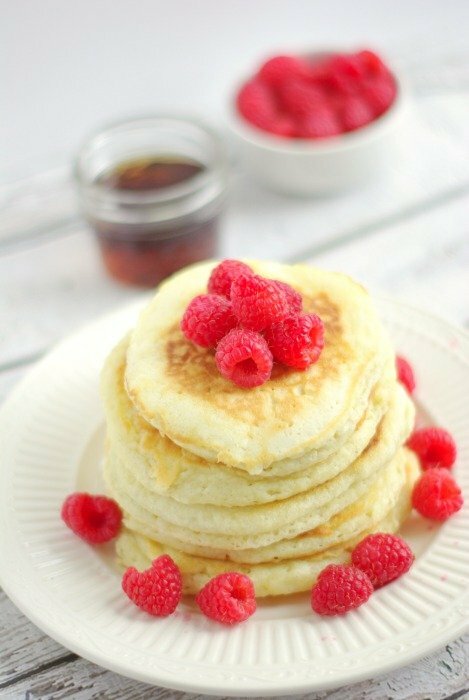 They are delicious with pure maple syrup and fresh berries. This recipe is easy to double when you have a big group for breakfast. Like all buttermilk pancake recipe, it’s important to start with your dry ingredients in one bowl and your wet ingredients in another. The key to light, fluffy pancakes or waffles is to not overmix the batter. Just fold in the wet ingredients into the dry until blended. This recipe is easy and basic. Feel free to add fresh blueberries, chocolate chips, fresh apple, sprinkles. You get the idea. In one bowl, mix your flour, baking powder, baking soda, salt and sugar. In another, melt your butter, add your buttermilk and blend in one egg. Gently fold in your wet ingredients with your dry. Let your batter sit for 3 to 4 minutes while you heat up your griddle or waffle iron. You want to heat up your griddle to about 350°F and add a tablespoon or so of canola oil and give it a minute to heat up. 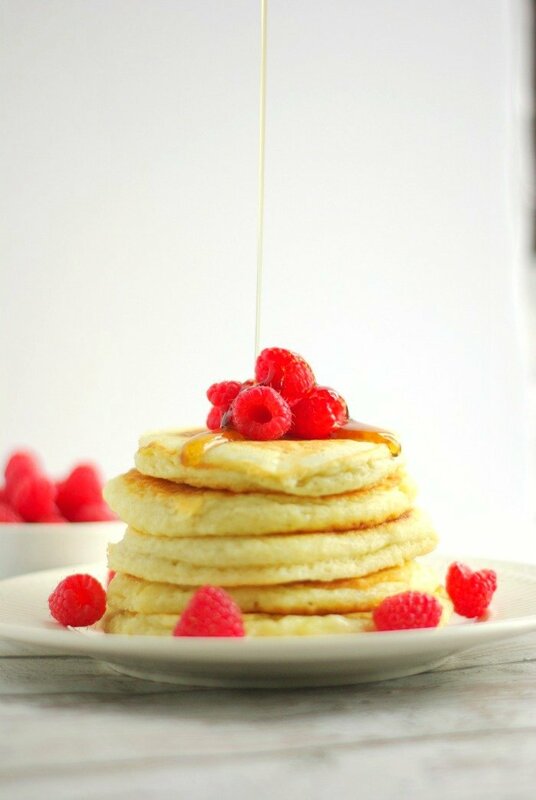 Using a soup spoon or a small ladle, pour enough batter onto your griddle to make pancakes of any size you like. Flip your pancakes after 3 to 4 minutes or when you see bubbles rise and the bottoms are browned. Finish cooking until the second side of your pancakes have browned. If making waffles, follow the directions according to your waffle iron. These are gorgeous! I can relate to the pancake/waffle thing. I adore waffles, my boys love pancakes. I always make pancakes it’s easier then getting out the waffle maker 😉 But I love that you can use this for both. Yum! Thank you. This batter is great for pancakes or waffles. Hope you enjoy it. 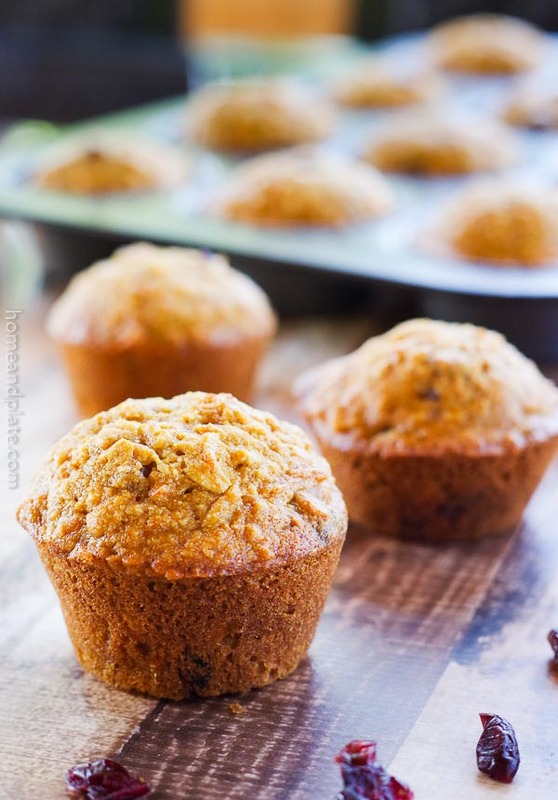 These do look light and fluffy! I’m sure my wife and kids would love them. These would be great with some of our homemade blueberry syrup. Blueberry syrup on these pancakes sounds amazing. That is a must try! 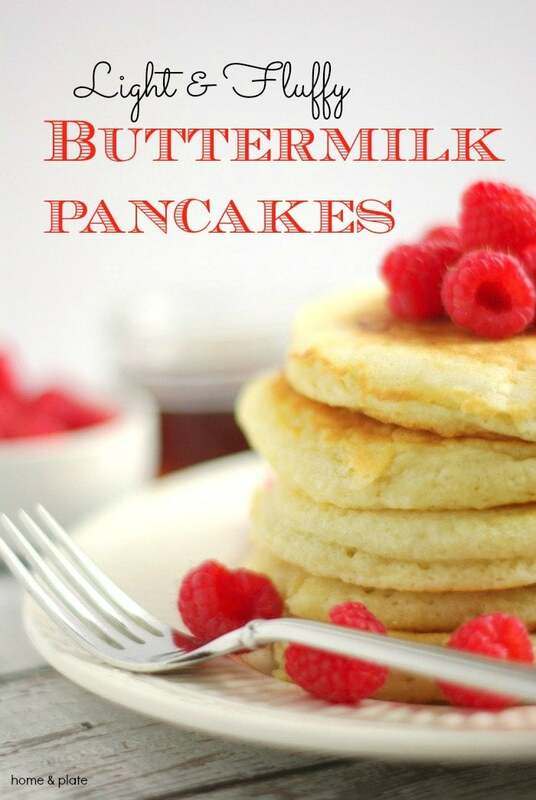 Buttermilk is the best for fluffy pancakes! 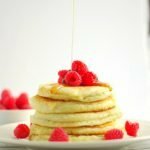 This stack looks like a great weekend breakfast! Thanks Anna. I agree pancakes are best with buttermilk. Believe it or not I never used buttermilk in my pancakes but it’s about time I started! Love the fluffiness here! YUM! You have to get buttermilk a try. It makes a huge difference. Thanks Nic.